The "Best Wii Game" of the Games Convention in Leipzig is hitting stores next month, with EA Montreal and Black Box announcing the official release date for Skate It, the Nintendo Wii and DS installments of EA's fledgling skateboarding series. Both versions will be shipping out November 19th in North America, with the European versions coming a day later on the 20th. Skate It of course returns you to the city of San Vanelona, which is apparently in ruins following some sort of catastrophe. Rather than help the city rebuild and aid people in gathering up the shattered remnants of the lives they once knew, you instead selfishly follow your dream of becoming Thrasher Magazine's Skater of the Year. Jerk.Get on Board with Skate It This November EA’s Award-Winning Videogame Delivers All the Fun and High Energy of Skateboarding This Holiday REDWOOD CITY, Calif.—(BUSINESS WIRE)—EA Montreal and Black Box, studios of Electronic Arts Inc. (NASDAQ:ERTS), announced today that their award-winning Skate It videogame will hit retail stores starting November 19th in North America and November 20th in Europe for the Wii™ and Nintendo DS™. With intuitive Wii remote, nunchuck and DS stylus controls and the optional use of the Wii Balance Board, Skate It delivers a fun and unique skateboarding experience for skate fans and gamers of all ages. Skate It brings gamers back to San Vanelona, a city that’s been safely evacuated, but left in ruins after being hit by a series of crazy events. Here, players are rediscovering their favourite spots, getting worked in Hall of Meat, and earning the opportunity to travel the world, all on their path to becoming Thrasher Magazine’s Skater of the Year. In Skate It, gamers will be able to make skate spots their own by moving objects like ramps, rails, and benches to fit their individual skating styles. The game also boasts a variety of multiplayer challenges, including Best Trick and Best Line, which will have players ripping it up with their friends as they prove their skateboarding prowess. Skate It recently received the “Best Wii Game” award at the Games Convention tradeshow in Leipzig, Germany. Skate It was also nominated for Best Sports game for the “Game Critics Awards: Best of E3 2008”. 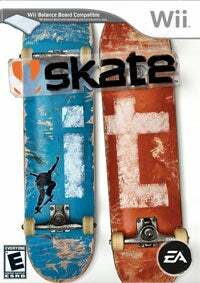 Skate It is developed by EA Montreal in Montreal, Quebec and Black Box in Vancouver, British Columbia and is rated “E” for Everyone by the ESRB and 7+ by PEGI for Wii and 3+ by PEGI for Nintendo DS.